First, I want to say congrats to the gorgeous blogger behind Fried Green Pickles, Megan, who is the winner of the Rifle Paper Co. giveaway! She is a gorgeous Southerner (I mean, look at these bridal portraits!) and I love following along, so if you haven't checked out her blog yet, it's a must! Major thanks to everyone who entered, I can't tell you how much I appreciate your support! I've got another giveaway coming next week so you can try your luck again... because who doesn't love free stuff!? 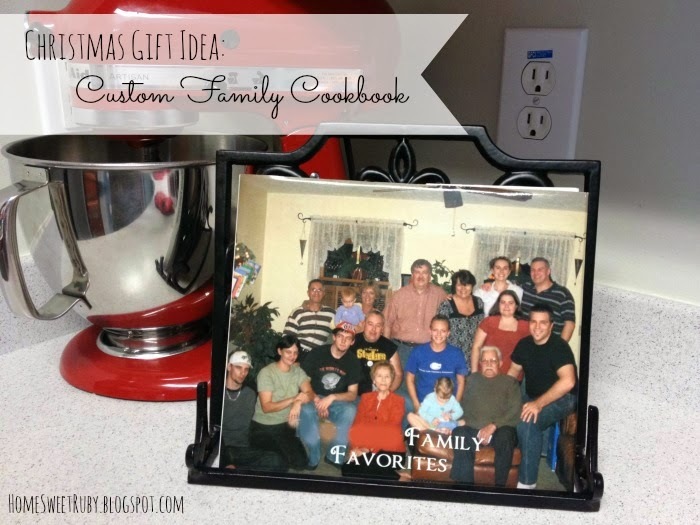 Today I wanted to share a great gift idea for those of you who have a big family that likes to cook. My family is Polish and I grew up eating the best meals, well I guess that isn't entirely true since I only ate mac n' cheese from ages 6 through 10. ha! 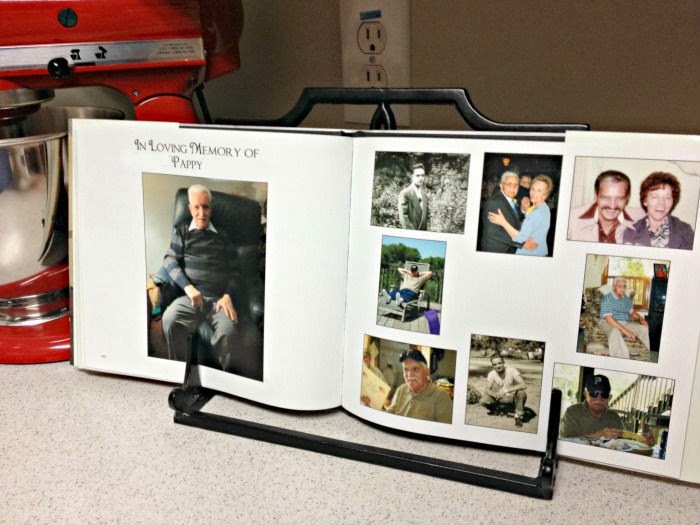 I actually made this family cookbook about 2 years ago, shortly after my grandpa passed away, and it was a huge hit with all of our family members. I'm sharing this with you now because I will tell you that it is a lot of work but..... it is SO worth it in the end. 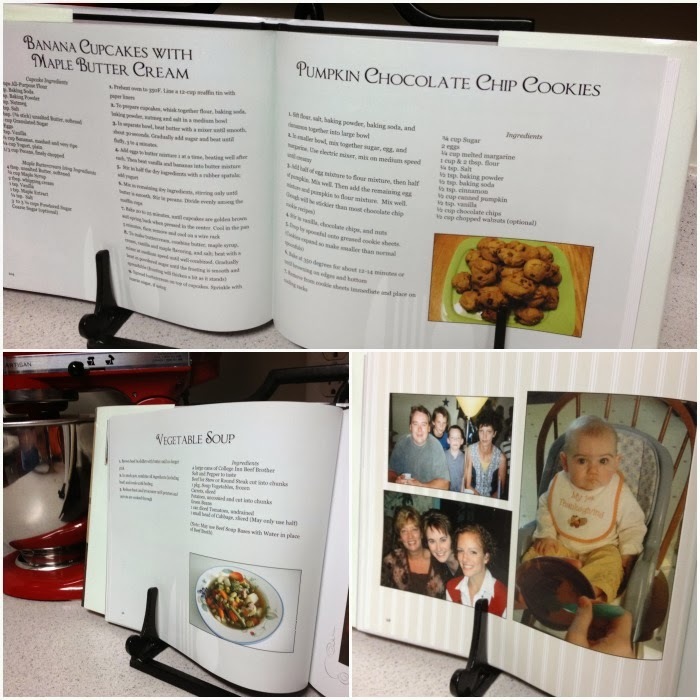 We now have a 100+ page cookbook, complete with all of my grandma's recipes and tons of photos of our family. It was truly a labor of love. Sorry, I blurred the last name! The first thing I did was contact all of my aunts and uncles to tell them I was making the cookbook and ask for copies of their favorite recipes and family photos. This is probably the hardest part because we had to keep reminding them and giving them fake deadlines. Since the cookbook was a surprise for my grandma, my mom had to "borrow" all of her little ripped up, food-stained, pieces of paper with partially written recipes. It was a hot mess. And like most grandmas, she knew all of her best recipes by heart, so we had to pretend like we were planning to make them and ask her for all of the ingredients and instructions. I used Blurb to make the cookbook, and I'm so happy with that decision. With a bulk discount (we bought about 13 for version 1 of the cookbook) and a promo code, it came to about $35 per cookbook. That included a hardback with a dust cover and premium coated paper. 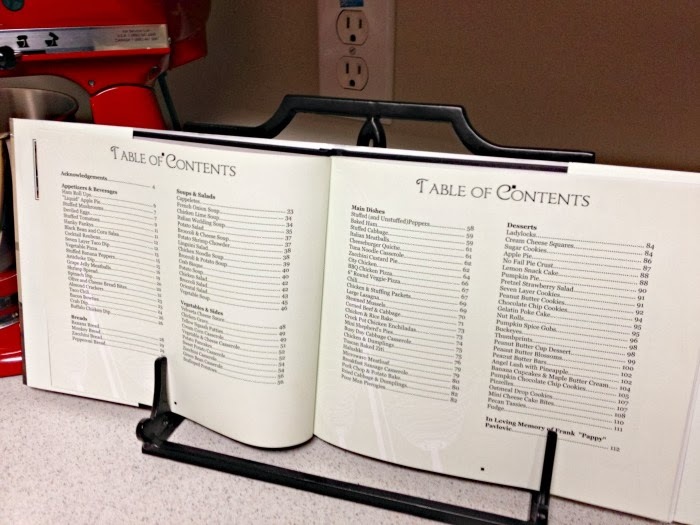 I had total control over how the cookbook looked, with fonts and everything. Another advantage is that Blurb will save your book online, so if you need to make adjustments or want to change it in anyway, you can make those changes very easily and have another version of the book printed! I did a table of contents, which was a ton of work, but I'm so glad I did. We also have a dedication page at the beginning, and a two-page spread in memory of my grandpa at the back. Look at all of those desserts! No wonder I have a serious sweet tooth! On the inside of the dust cover, I put all of our family members' birthdays and all of the anniversaries. At the time, Steve and I didn't pick a wedding date yet, so I put TBD and in the second version of the cookbook we easily made the change. On each of the main pages for Appetizers, Soups, Desserts, etc., I put a wedding photo of one family and then a recent photo of them with their kids. It worked out perfect that we had one family for each section of the book, but when we include Steve and I, we're going to have to make up another section... ha! As you can see, there is a lot that goes into this project. But if your family is anything like mine, they will absolutely love it and it will be a great keepsake for everyone. It was so fun surprising my grandma with it, she just couldn't believe that we had all helped put it together without her knowing! Has anyone else done a personalized gift like this for their family? I'd love to hear what you did! Thank you!! It is totally worth all of the effort, I promise! fabulous idea! My Mother-in-law would be in heaven! o.m.g. that is the sweetest, best idea ever!! 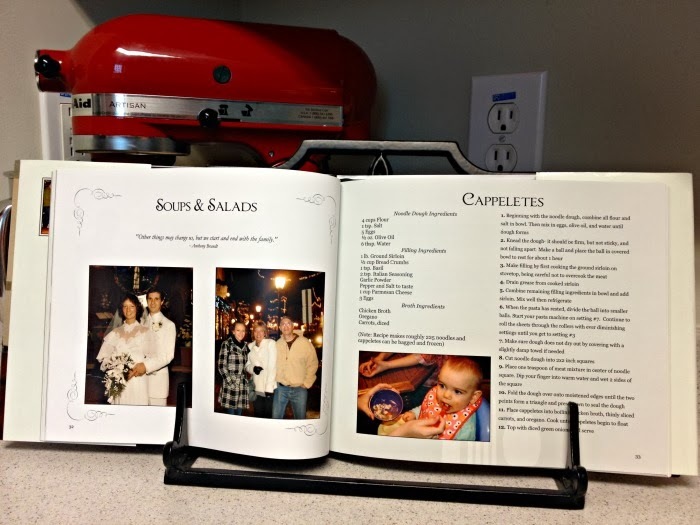 the closest thing I did like that was make photo calendars for my grandmothers, which they loved, but the cookbook is much more special! Did you do both sides of your parents families or just one side? PS - Thanks for the SUPER sweet shout out! That is awesome! I make my dad a calendar of just himself. Haha it's an ongoing joke but hilarious every Christmas! My mother-in-law got a bunch of recipes from their side of the family and made this for me for my wedding. Ok, if you were in my family you'd be given a trophy for this! This is Ah-mazing! haha thanks Courtney! It was definitely a lot of work but I'm so happy with how it came out, and we can add to it in the future! such a sweet idea! How fun that you got all of the family involved in the making of it! That's amazing! What an awesome family gift! I'll be honest I don't have the patience to do all that. I can only imagine how much time it took! What a fabulous idea for a project!!! what a great idea!! I may have to start on this for a christmas gift next year!